When we think of garden pests most people would be quick to name an insect. Actually, any insect or animal can hamper the growth or health of plants and of course, not all insects are harmful. The most common pests are insects or animals. Specific pests vary in different areas of the country. Along with vegetables and flowers, trees and shrubs can be attacked by leaf miners, borers, beetles, scales, caterpillars, and worms. Insects are the biggest category and the most abundant. These garden pests will chew on leaves and fruit. Some of the pests are named for the particular plant they attack and destroy. 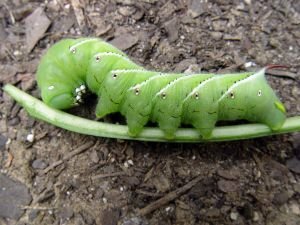 The caterpillar category consists of tomato hornworm (pictured to the right), codling moth, cabbageworm, and cabbage looper. Grasshoppers will chew the leaves of many plants. Small insects that cause foliage destruction are white flies, aphids, mealybugs, scales, squash bug, spider mites, leaf miners, stink bugs, and gypsy moths. Beetles such as the Japanese beetle, lily leaf beetle, cucumber beetle, sweet potato weevil, and flea beetle can also damage plants by chewing on foliage. Boring insects such as the squash vine borer, peach tree borer, and the European corn borer also cause plant destruction. Constant inspection is necessary throughout the growing season because certain insects will appear at different times of the growing season. There are insects that find the tender young stems and plant roots very tasty and cause destruction such as the cutworm, wire worm, earwig, nematode, and slugs, and snails. When we discuss garden pests, animals are also included. Small animals that cause damage by burrowing, digging, and chewing foliage and roots include chipmunks, squirrels, mice, voles, gophers, groundhogs, opossum, raccoons, rabbits, moles, and prairie dogs. The large animals such as bear and deer will also invade a garden. Birds such as crows and blue jays eat corn, and other birds will eat the seeds, fruits, berries, and nuts. Also be on the lookout for geese and ducks that can inflict damage to plants. Controlling will depend on what type of pest is harming your plants. When working with insects spraying organic or inorganic pesticides will control them, but remember that these products can also kill beneficial insects. Beneficial insects such as ladybugs, praying mantises, along with frogs and toads will certainly limit bad bug numbers. Companion planting will also inhibit the bad bugs. Herbs such as chives, garlic, Marigolds, mint, onions, oregano, sage, rosemary, thyme, leeks, and basil help repel aphids, moths, worms, beetles, and flies. Planting eggplants with potatoes has been found to trap potato bugs. When it comes to controlling animals our resouces include fencing (including electric), inflatable owls, snakes and scarecrows. Your city services department or animal warden may provide assistance with trapping and removing small animals. Deer can be a real problem in suburban or country gardens. Some have reported success with hanging bags containing human hair or strongly scented soap scraps around the garden. Sprinklers controlled by motion detectors are another solution some folks have used with success. If you require further information about controlling pests your state’s Cooperative Extension Service as well as garden and farm supply centers will be able to give good advice on this subject especially for the area in which you live.